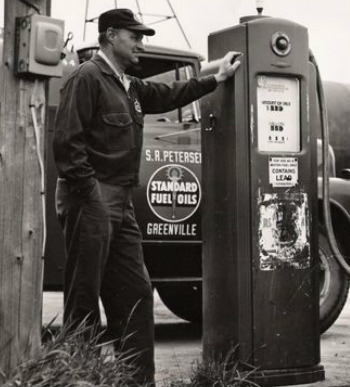 Petersen Oil & Propane began in 1947 when Stan Petersen began working for Standard Oil Company as a commissioned fuel delivery agent. Stan purchased the Greenville territory from Standard Oil in the 1970's and began his own distributorship continuing to supply Standard Oil fuels and lubes. In 1976 the business was sold to his Son Tom and Son in Law Kevand. during the 1980's the business grew through acquisitions of neighboring distributors and the building of several gas station/convenience stores. In 1990 the company added Propane service and became Petersen Oil & Propane. Presently the company is owned and operated by Stan's grandson Mike Petersen. Most of the stations built and acquired through the years were sold in 2003 and the company now focuses on the fuel and propane delivery and procurement business.